LaMelo Ball is a fine basketball player. He will be a fine college player. Very possibly he will be a fine NBA player. He is also 15 years old. I don’t know whether that’s an explanation for the following, or a reason not to post the following on the internet, or both, or neither. I just know I laughed my goddamn head off watching it, and maybe you will too. In our staff chatroom this morning, we kicked around the question of whether posting a 15-year-old’s lowlight reel is morally or ethically bad, a question which in this case is complicated somewhat by the fact that the 15-year-old is this 15-year-old. 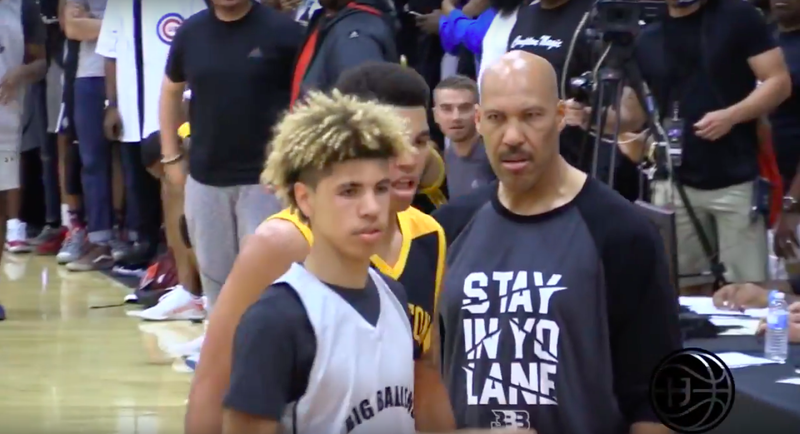 After all, we happily posted a highlight reel of Ball’s 92-point game a few months back, a fact which is itself complicated by the degree to which everything LaMelo and his big brothers Lonzo and LiAngelo do is basically just viral marketing for their dad’s shoe brand/spiral-eyed vicarious life do-over attempt. After much careful consideration and personal introspection, I have concluded that a teen baller feeling himself, pulling up from outer space, and banging the ball off the backboard like six miles from the rim is objectively newsworthy no matter the teen, because it’s funny whenever a teen forgets the remaining distance between the teen he is and the adult he wants to be and/or that the adult he wants to be is a fantasy creation that almost certainly could never exist. If we cannot laugh at teens on the front page of internet media organs, what the hell is the point of having a free press.